It's cold. It's dark. Literally and, for some, figuratively. You could use a break. Without using up the last of your vacation days. We want to take you to another level of relaxation. 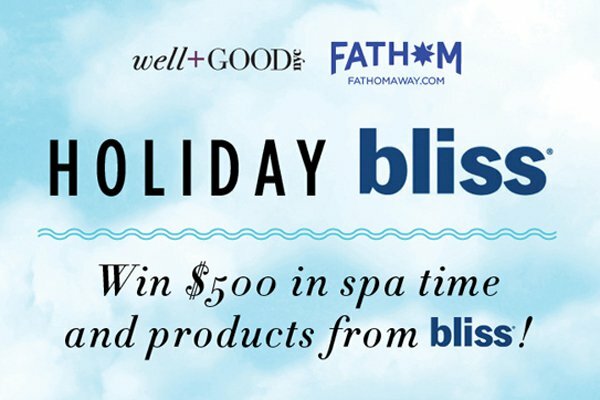 So we teamed up with the fine ladies of health and wellness site Well + Good to bring you Bliss, in the form of a $500+ spa package. Spa services can be redeemed at any of the following locations: Bliss Soho, Bliss49, Bliss57, Bliss Hoboken, Bliss Hollywood, Bliss Los Angeles, Bliss San Francisco, Bliss Atlanta Midtown, Bliss Dallas, Bliss Chicago, Bliss Scottsdale, or Bliss South Beach. The contest ends December 30, 2013. Good luck! Every contest has fine print. Read it here.